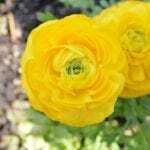 Ranunculus buttercup plants produce cheery multi-petaled flowers. The almost unpronounceable name covers a large group of perennials from Asia and Europe. The plants aren’t very hardy and may be annual in colder zones. They are easily damaged by temperatures below 28 F. (-2 C), and thrive best in USDA zones 8 to 10. A colorful field of flowers livens up the landscape and is easy to achieve with Ranunculus plants. Ranunculus bulbs come in several sizes and are best planted 4 inches apart. Using buttercups for the garden will reward the grower with an abundance of color and texture from early spring into the first month of summer. Buttercups for the garden come in an array of colors from white, red and gold to orange, yellow and pink. The flowers boast layers of petals and will develop up to 12 inches in height. You can choose standard sized Ranunculus plants or dwarf specimens, which only get 8 inches high. Some varieties will produce flowers that span 6 to 12 inches in width. You may start Ranunculus bulbs directly outdoors or purchase started transplants at a nursery. The tubers must be soaked prior to planting for best results. Use the plants in borders, containers and wildflower fields. The thick rosettes will last for a week or more when used as cut flowers. Plant Ranunculus bulbs outside in fall in warmer zones and start them indoors in pots in cooler climates. Growing Ranunculus flowers starts with planted roots or tubers. Often called Ranunculus bulbs, tubers are different but have similar structures and purposes to the more common bulb. Plant the bulbs or tubers in fall for a glorious spring display. Growing Ranunculus flowers requires well-drained soil and full sun for best results. Soak the tubers and then plant then with the roots or fingers pointed downward at a depth of 1 to 2 inches, depending on the size of the bulbs. Buttercup is an easy flower to grow. Care of Ranunculus to ensure yearly displays may require that you pull out the tubers at the end of the season. Allow the foliage to almost completely die back and then dig out the tubers. Lay them in a cool, dry place to evaporate all the moisture from the bulbs. Store the tubers in a dark location until spring and then start them indoors in pots. Replant the buttercups outside when all danger of frost is passed and the first true leaves are evident. Ranunculus buttercup plants require temperatures of no more than 60 F. (16 C.) during the day and 45 to 50 F. (7-10 C.) at night to break dormancy and begin sprouting. Ranunculus plants may survive as perennials in Zone 7 if you mulch lightly around the bases. Follow these suggestions when growing Ranunculus flowers for garden displays or cut flowers and you will reap the rewards year after year. Read more articles about Ranunculus.